We offer you a huge number of accessories to our professional acoustic arrangements. Microphones for every need whether wirelessly on radio or wire-engaged. 100 V attenuators and commutation units as well as any wiring box. The products are made by g+m, and can be adapted therefore on your needs. Besides, you also receive mobile acoustic arrangements for the cemetery, the school or, e. g. , a seminar. For every wish we offer you the meeting demand product. Active and passive loudspeakers can be used universally. With clearly understandable speech they find use in acoustic emergency warning systems. Or provide as a music loudspeaker for an excellent sound experience. All loudspeaker systems are continuously adapted in our inhouse acousticroom and will be optimised all the time. Get to know our highlight: the active sound column. It radiates tone in the respective space optimally and reflexions is reduced and the speech intelligibilit is clearly raised. The LC-CD mixing-amplifier family is ideally for use in smaller office environments for clear voice announcements and good quality background music. The 6 inputs can be configured universally for speech or music, whereby the possibility for the triggering of freely determinable chime or speech files in WAVE-format rounds off the unit’s functionality. The customer requirements can be configured simply and easily with the integrated user interface. The modular connection of an additional housing (LC-CD-EXT8) in combination with the digital microphone console enables announcements to be made in up to 8 different zones with simultaneous background music in other areas. The digital amplifier range from 50 – 250 W with 100 V technology allows for implementation in larger spaces without restriction in respect of placement of loudspeakers and for the combination of any loudspeaker types. The Compact-S Universal Audio Centre is ideally suited for use in sales areas, medical practices, restaurants, small to medium sized event venues – in fact anywhere where background music either on its own or in combination with announcements is required. As a modular system the Compact-S Audio Centre can be adapted to achieve the desired result in all kinds of situations: From the tuner module via telephone interfaces to public address from the digital microphone console in up to four different zones. The digital amplifier range from 50 – 250 W with 100 V technology allows for implementation in larger spaces without restriction in respect of placement and combination of any loudspeaker types. The EVAC-MC system is a compact voice alerting system for the school sector with integrated master clock. It serves the purpose of controlling analogue and digital clocks, tripping time-controlled messages and signals, generating voice announcements, controlling background sound and direct tripping of safety-related and security-related signals and messages. The integrated emergency power supply system guarantees operation in the event of power failure. The system is suitable for all premises and installations requiring targeted, simultaneous voice information in all areas. Time-controlled signals, such as break bell, can also be integrated. The VA-450 is a compact all inclusive voice evacuation system already integrating all important functions and components. It is optimally suited to all premises and installations in which a PA system is used for emergency announcements and is thus a central part of the safety and security concept, complying with the full scope of standard EN 54-16. The permanent self-surveillance provides warning of failure to any component critical to system operation and even switches over automatically to the integrated emergency power supply or stand by amplifier. PA announcement into each individual zone in combination with background music completes the high functionality of this compact evacuation system. With this APS® generation we have developed a smart system solution for you, a system that is typically what we produce at g+m elektronik ag: Swiss precision, completely user-friendly and ideally positioned for the future. 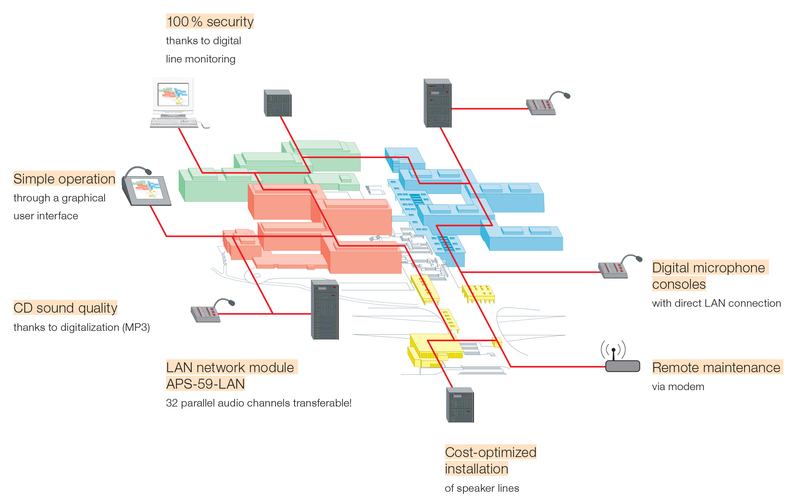 Thanks to features such as LAN networking and DSP technology, our APS® technology meets your very high demands for Voice Evacuation Systems, Public Address and Background Music solutions. Made in our own plant this brand sets standards globally.